Copywriter | Portfolio | High Tech Copywriting . My client, one of the biggest high tech companies in the world, regularly brings out new, cutting-edge projectors for a number of different markets. I've written a lot of the copy they use to introduce the new models. 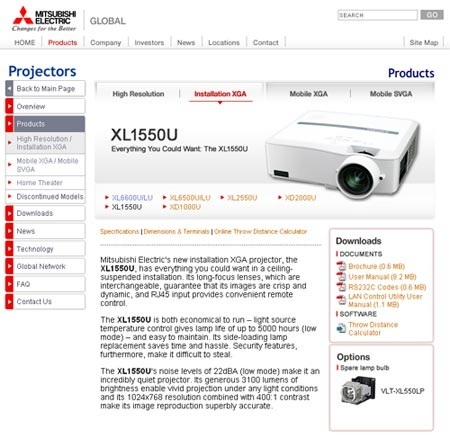 Each projector introduction page has a specific design and size, which means that the copy has to be written to very exact guidelines: three paragraphs, with each paragraph having around 40 words. I look at the model specifications, noting what points to stress, and write the copy to be easy to read, while at the same time getting over as much information as possible in 120 words. Not initially knowing anything about the industry, I had to get to know what the parameters and meanings of new words and acronyms like "lumens" and "RJA" were. It's now second nature to be able to pick out a new projector's strongest points. Depending on the model, I can be writing for the attention of regular consumers, teachers, lecturers, IT managers or marketing executives. Some are looking to buy the best projector on the market, while some are looking for a hard-wearing model that will be cheap to run. Mitsubishi Electric's new installation XGA projector, the XL1550U, has everything you could want in a ceiling-suspended installation. Its long-focus lenses, which are interchangeable, guarantee that its images are crisp and dynamic, and RJ45 input provides convenient remote control. The XL1550U is both economical to run -- light source temperature control gives lamp life of up to 5000 hours (low mode) -- and easy to maintain. Its side-loading lamp replacement saves time and hassle. Security features, furthermore, make it difficult to steal. The XL1550U's noise levels of 22dBA (low mode) make it an incredibly quiet projector. Its generous 3100 lumens of brightness enable vivid projection under any light conditions and its 1024x768 resolution combined with 400:1 contrast make its image reproduction superbly accurate. If your company regularly introduces new high tech products to the market, I can write for you. Drop me a line.